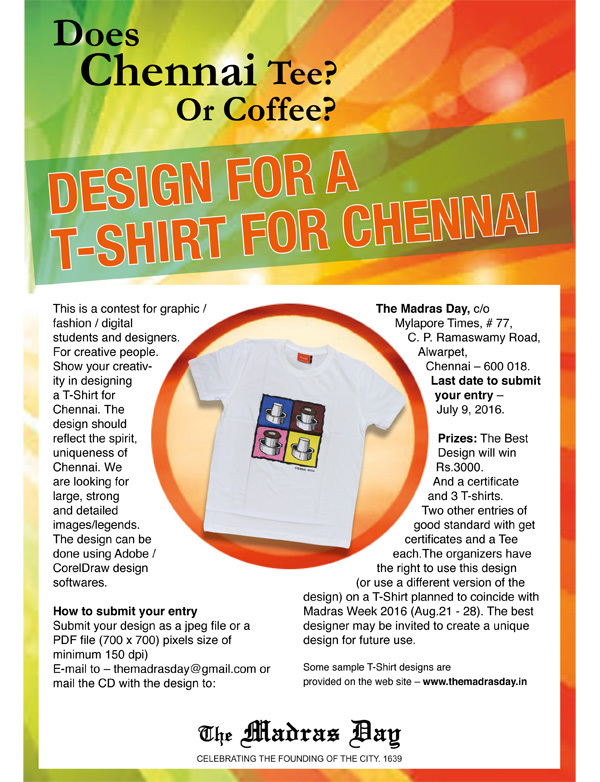 This contest is held in connection with MADRAS DAY 2016 (Aug. 22 is celebrated as Madras Day) which celebrates our city. 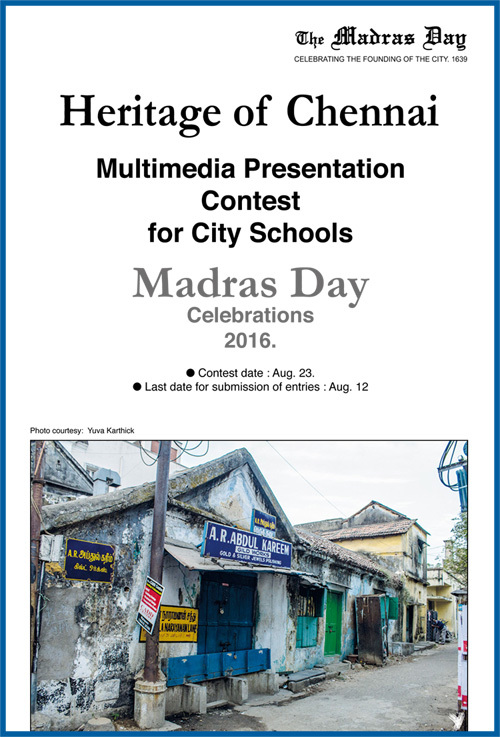 The contest encourages city school students to explore Chennai’s heritage and present the topic given to you in multi-media form. This contest has been held for the past 13 years. GUIDELINES: We want you to choose a street in an old sector of our city which has old houses and buildings (at least 10 of them on either side). Study the streetscape, the local architecture, the nature of houses and residents and the striking features of this street. Take classy photos, make notes, talk to people in the know. >> The contest is open to school children studying in classes 8 to 12. >> A school can send only one team. Each team MUST have 3 members and all 3 members must take turns to make one presentation. 1. Identify a street that goes back in time – 1930s-60s for your study. Make sure the street has great old features. Ask your school teacher-adviser to seek the approval of the organisers. E-mail to – themadrasday@gmail.com – and get the OK to start work on the project. 2. Do street-based research, undertake a tour of the place to take pictures on the spot, notes and interview people who can give you more inputs. Take photos and videos – use them in your project. We look for multi-media rich projects. 3. Back at your desk put the project together with pictures and the main points in the Power Point presentation capsule and explanation notes written on sheets of paper. (On each slide, you must have a maximum of just 3 lines, each line 5 words only. Dumping content on a slide earns you minus marks!). 4. At the contest venue, your team of 3 students will take turns at the mike to present the project using the PP. You can use your notes for reference as your speak. 5. The presentation in PowerPoint on the approved theme will have to be done by all the three participants. It can be done in English or in Thamizh or a mix! 7. The PowerPoint presentation should be submitted to the organisers on or before Aug. 12, 5 pm. 8. The team should retain a copy of your project on a pen-drive or copy it to an electronic device and bring it to the venue of the contest. The organiser will provide a PC and a projector at the venue to help you make your presentation. 9. The Contest is open to first 25 teams to register on first-come-first-serve basis. 11. The best THREE presentations will be awarded TROPHIES, gifts and certificates. All participants will be given certificates. The prizes will be given at about 3 pm. 12. Prizes will be awarded based on quality of research / presentation of visuals and points / presentation format and answers to the questions posed by the judges. This event is supported by Mylapore Times, the neighbourhood newspaper and South India National Association (SINA), Luz.